Home » How Do I Pick the Right Grant? This is a flowchart to assist the applicant to choose an appropriate grant mechanism for his/her career stage and preparedness with preliminary data. Although this flowchart does not replace the advice of a NIDA program official, it serves as a rough guide. 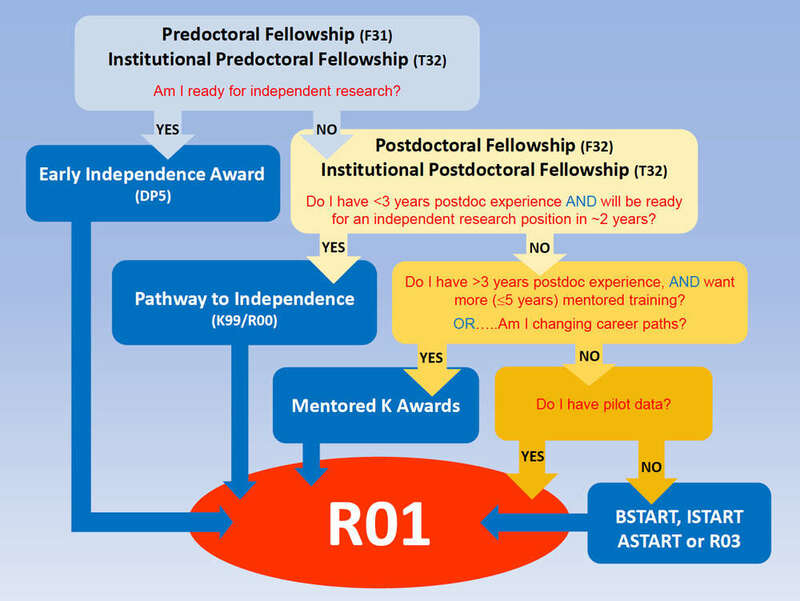 According to the flowchart, those candidates who are ready to skip the postdoctoral period after receiving a doctorate and proceed directly to an independent research faculty position should consider the NIH Early Independence Award. Those who are not ready for an independent research position should consider applying for a NRSA postdoctoral fellowship. If outstanding progress is made during a short period of time during the postdoctoral stage and the candidate has the preliminary data for a NIH independent research award or R01, the candidate should consider applying for said R01 as an early stage investigator. Alternatively, if the postdoctoral candidate does not have the preliminary data for a R01 and requires an additional period of mentoring, the candidate should consider a Pathway to Independence (K99/R00) award or other mentored career development award. Those requiring more mentoring than the K99/R00 can provide should opt for a three to five year mentored career development award (K01, K08, K23, or K25, depending on the type of doctorate (s)he has and the type of research (s)he is proposing). 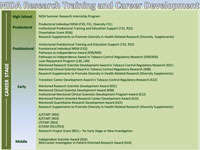 Whether the candidate receives a K99/R00 award or other mentored career development award, the candidate should subsequently apply for an independent research award such as the NIH R01.